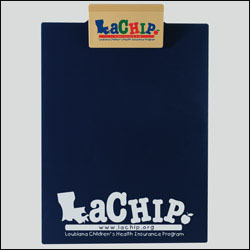 Full-sized clipboard with a 4" clip holds a standard 8 1/2" x 11" writing pad. Imprintable on the clip and on the board. Price includes 1 color imprint on the clip. Recycled logo will be added in same color as imprint. Minimum order is 50 units with a $50.00 less than minimum charge.